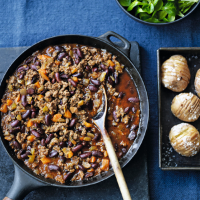 This classic chilli con carne is really easy to make and prepare and creates a delicious chilli for six people in under an hour. 1. Heat the oil in a large non-stick sauté pan. Add the soffritto mix and garlic and cook over a low heat for 3 –4 minutes until softened but not browned. Push the vegetables to the side of the pan and turn up the heat. Add the mince and break up with a wooden spoon. Cook for 3–4 minutes until lightly browned. 2. Add the oregano, chilli powder, Worcestershire sauce and tomato purée. Stir well then add the stock. Bring to the boil, half cover the pan with a lid and simmer for 25 minutes until the liquid has reduced by half. 3. Add the beans to the pan and bring to the boil. Simmer for 10 minutes then serve with baked potatoes and a fresh green salad.